Not to be confused with Derek Lee (disambiguation) or Derrick Lee (disambiguation). Derrek Leon Lee (born September 6, 1975), or "D-Lee", is a former Major League Baseball first baseman. Lee played with the San Diego Padres (1997), the Florida Marlins (1998–2003), Chicago Cubs (2004–2010), Atlanta Braves (2010), Baltimore Orioles (2011) and Pittsburgh Pirates (2011). He bats and throws right-handed. Lee was a World Series Champion with Florida in 2003, and he won the National League batting title in 2005. He was a two-time All-Star selection, and won the Gold Glove Award three times. Lee was born on September 6, 1975. Leon Lee is his father and Leron Lee is his uncle. Each of them played professional baseball in Japan. During his elementary years Lee lived in Japan, and during his high school years he often lived there during his summer breaks. Lee was born in Sacramento, California. Lee played Little League Baseball at Whitney Little League and graduated from El Camino High School in 1993. Lee was drafted in the first round (14th overall) of the 1993 Major League Baseball draft by the San Diego Padres, and made his major league debut on April 28, 1997. Traded, along with prospects, to the Florida Marlins a year later for Kevin Brown, Lee was a member of the 2003 World Series Marlins championship team. Lee won his first Gold Glove during the 2003 championship season and his spectacular grab and unassisted putout on a hard hit Hideki Matsui one-hop line drive snuffed out a Yankees rally and ended Game 5 of the World Series with a Marlins victory. The Marlins went on to win the World Series in Game 6. Lee was traded to the Cubs for Hee-seop Choi. He hit .278 with 32 home runs and 98 RBIs in his first year with the Cubs. In 2005, Lee had a career first half of the season, with a MLB-leading .376 batting average, 72 RBIs, and a tie for the major league lead in home runs with 27. The Cubs had traded superstar Sammy Sosa, who had previously been one of their best hitters, before the 2005 season. Lee showed early on that he could more than compensate for the loss, and while Sosa had a disappointing 2005 season with the Baltimore Orioles, Lee had a career year. By midseason, he was among MLB's leaders in each of the triple crown categories: batting average, home runs, and RBIs. Lee hit his 200th career home run on August 28, 2005, off Florida Marlins starter Josh Beckett. He finished the year with a career-best 46 HR. His .335 batting average was the highest by a Cub since Bill Madlock's .339 in 1976 and made him the first Cub since Bill Buckner in 1980 to win a National League batting title. He also won the Gold Glove at first base that year. Lee was named to the U.S. roster for the 2006 World Baseball Classic, where he was the first player to hit a home run for Team USA in the World Baseball Classic. On April 10, 2006, Lee signed a five-year, $65 million extension with the Chicago Cubs. The deal replaced his contract for the 2006 season and extended him as the Cubs' first baseman through the 2010 season and included a no-trade clause. He broke his wrist less than two weeks later, in a collision involving baserunner Rafael Furcal, and he missed 59 games due to the injury. The Cubs posted a 19–40 record during Lee's stint on the disabled list. Later, Lee went back on the disabled list with a post-traumatic inflammation in the outer bone of the medial side of the wrist. In 2008, Lee hit 20 home runs, 90 RBIs and had a .291 batting average as the Cubs had the best regular-season record in the National League. In 2009, Lee ranked ninth in the voting for NL MVP, as he had a .306 batting average, and hit for 35 home runs and 111 RBIs, though the Cubs did not qualify for the NL playoffs. On June 9, 2010, Lee hit his 300th career home run in a game against the Milwaukee Brewers. On June 25, 2010, Lee was involved in a dugout altercation with Cubs pitcher Carlos Zambrano after the pitcher gave up four runs in the first inning and apparently blamed Lee for failing to field a sharply-hit lead-off double. Zambrano was suspended for his behavior. Lee playing for the Braves. In late July 2010 Lee used his ten and five rights to veto a trade to the Los Angeles Angels. On August 18, 2010, Lee, with his approval, was traded to the Atlanta Braves for minor league pitching prospects Robinson Lopez, Tyrelle Harris, and Jeffrey Lorick. Lee began to serve as the Braves' starting first baseman on August 20, 2010, including postseason play in the NLDS. 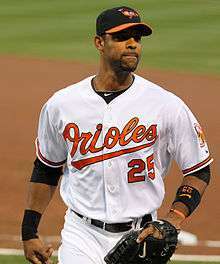 Lee was signed from free agency to a one-year contract with the Baltimore Orioles for the 2011 season. He played in 85 games with the struggling Orioles, batting .246 with 12 home runs and 41 runs batted in. On July 30, 2011, Lee was traded to the Pirates for minor league Class A first baseman Aaron Baker and cash considerations. Lee hit two home runs in his first game as a Pirate. He was hit by a pitch and broke a bone in his left wrist on August 3, and missed most of the next month, but then finished the season productively as the Pittsburgh first baseman. Playing in 28 games as a Pirate in 2011, Lee batted .337 with 7 home runs and 18 RBIs. Lee is the son of Leon Lee. Leon never played in the Major Leagues, but did play professionally in Japan. Today, he is a scout for Major League Baseball and, coincidentally, he was the scout who "found" Hee-Seop Choi who was later traded for his son. Lee is the nephew of former Major League outfielder Leron Lee, who played eight seasons with the St. Louis Cardinals, Dodgers, Indians, and Padres. Currently, he works with the Cincinnati Reds as an advising batting coach to scouted players. The 1st Touch Foundation was established in 2005 by Lee and his wife as a vehicle to encourage and support the educational aspirations of the community's young people. The initial vision was to build The 1st Touch Academic Youth Center in Sacramento, California. In 2009, Lee unveiled a cabernet wine called CaberLee through Charity Wines where 100% of the proceeds will benefit the 1st Touch Foundation. However, in September 2012, the foundation closed after helping children in Sacramento for seven years. Lee has visited countries such as Uganda and Israel to help out with the baseball programs. He visited the Israel Baseball Academy in 2015 helping them out with skills while visiting the country. Wikimedia Commons has media related to Derrek Lee. ↑ ESPN.com news services (April 11, 2006). "Derrek Lee agrees to new five-year, $65M deal". ESPN.com. Retrieved November 27, 2008. ↑ Pittsburgh Pirates official press release (July 31, 2011). "Pirates acquire Derrek Lee from Baltimore". Pirates.com. Retrieved August 1, 2011. ↑ Muskat, Carrie (February 4, 2009). "Cubs fans can be in movie, aid charity". mlb.com. Retrieved March 17, 2009.